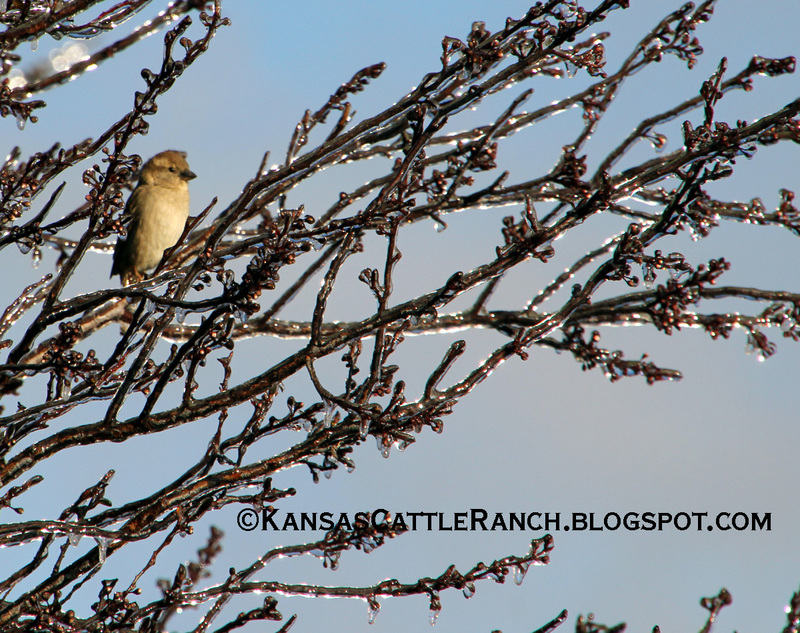 Kids, Cows and Grass: Welcome Spring to Kansas...with ice! 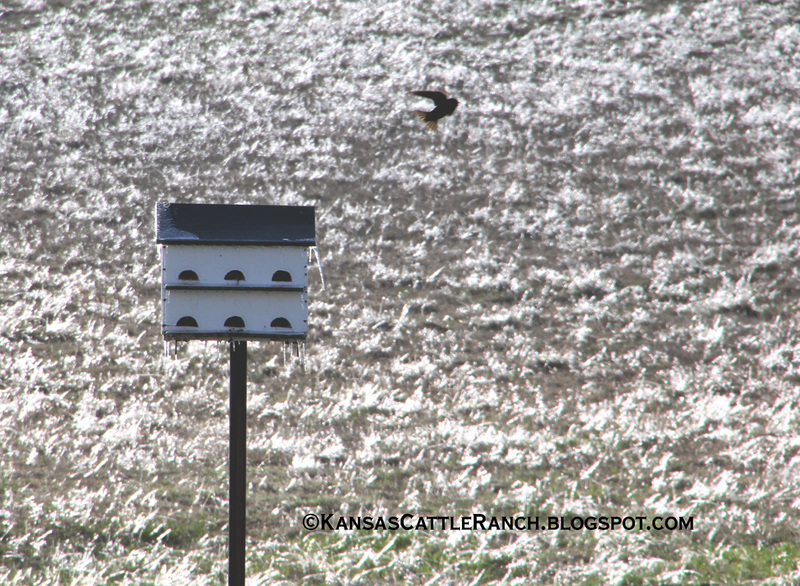 Welcome Spring to Kansas...with ice! 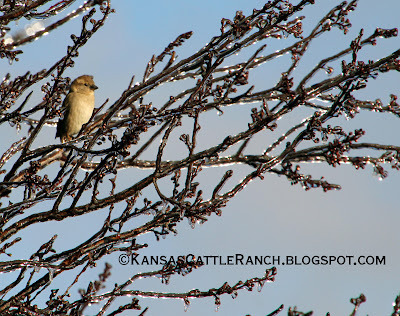 Spring has returned to Kansas...with a lovely rain in freezing temperatures, turning the trees and grass into ice sculptures! 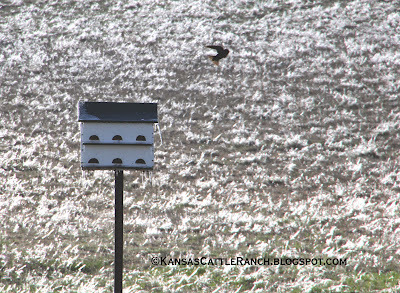 It surprised the purple martin scouts--they are checking out our house and fluffing their feathers to stay warm! The grass had just started to take off and grow...and along came ice! Luckily our wheat is not growing fast enough to be at a stage that it will be injured by the cold. I hear that the wheat in western Kansas is not so lucky! The birds are chilly this morning in the trees, but they will be warm enough by Sunday with 75 degree temperatures predicted! The bulls were wandering their pen in the cold, wondering why we hadn't spread new straw for their beds. That was next on the list! Brrrrrrr! Thanks, Mary! We got an inch of rain and the last hour or so was ice. Then all day yesterday it misted in freezing temps. So not much moisture, but lots of ice on everything. I'm trying to keep a positive attitude--it is moisture, right?! I love the bird photo! Great capture. Time will tell on our wheat in South Central Kansas. Kim, I had to stop what I was doing when I saw him/her in the tree! I just had to get my camera! It was a beautiful morning with the sun shining and the ice nearly glowing. I couldn't pass it up. I'll keep my fingers crossed that your wheat is unscathed. We are pretty desperate for a good crop--despite the drought! Love all the photos (amazing how nature can be so beautiful, yet so potentially devastating at the same time) and the explanation on the wheat crop...I hope Western Kansas wheat is not totally injured. Keeping our fingers crossed that the remainder of April and Mother Nature is kind. My sentiments exactly, Laurie. We can't deny that nature is awesome! Thanks for the support--I hope the rest of April is rainy and warm! !